The government and ethnic groups’ representatives reached an agreement in principle to work towards getting the Nationwide Ceasefire Agreement signed and starting the process of drafting a political dialogue framework with President U Thein Sein’s administration. The Union Peacemaking Working Committee led by Minister U Aung Min and the Ethnic Senior Delegation led by Padoh Naw Zipporah Sein met on July 3rd and 4th in Chiang Mai, Thailand for the first time, since the senior ethnic delegation was formed. The preliminary meeting was to exchange views before an official round of talks take place in Rangoon, which according to U Aung Min, will be held around the third week of July. Padoh Naw Zipporah Sein, vice chairperson of the Karen National Union and who is to lead the Ethnic Senior Delegation said in an interview with Karen News that the government’s negotiators are pressing to have a NCA agreed to before the national elections. Padoh Naw Zipporah Sein, told Karen News about the issues discussed at the meeting. Minister U Aung Min who led the UPWC delegation also gave his impression on the meeting at the end of the session. 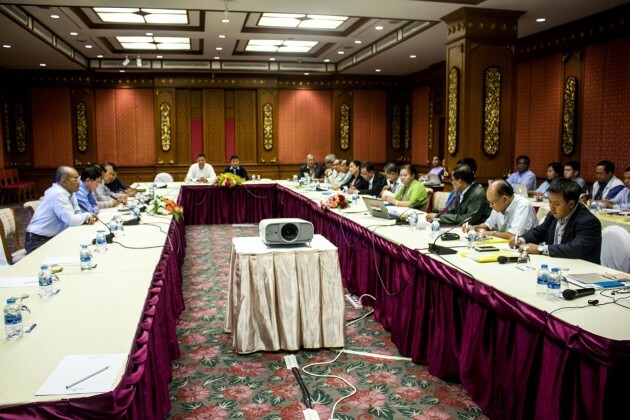 The draft nationwide ceasefire agreement that was earlier agreed to by the ethnic armed groups Nationwide Ceasefire Coordination Team and the government’s UPWC was not approved at the last ethnic armed organization summit held at Law Khee Lar in Karen State in early June, 2015. Ethnic leaders at Law Khee Lar summit raised 15 points from the draft NCA that they said needed further negotiation. Padoh Naw Zipporah Sein told Karen News about how they discussed these issues with the UPWC delegation at the Chiang Mai meeting.